What are your projections for Russia? 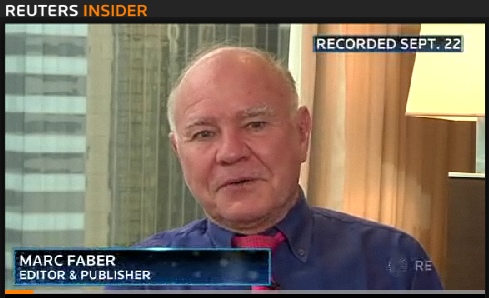 MARC FABER : Well basically, my partner and I had one of the first Russian funds, Firebird, which we started in 1993. Firebird still exists although I am no longer a partner, but it was a very successful hedge fund that invested not only in Russia, but also former Soviet Union countries and has investments in countries like Mongolia and so forth. I think it is difficult to say I am bullish about this country or bearish about that country. I think it depends very much on what kinds of sectors of the economy you invest in, what kinds of companies, and what kind of partners you have and if they are reliable or not. In general, the valuation of Russia is very low compared to other emerging economies. However, should commodity prices come down, I do not think there would be much growth in the Russian economy. We have a lot of issues as well about corporate governance and so forth. I have played Russia more in recent years through the debt market. In other words, I hold bonds of Russian issuers.